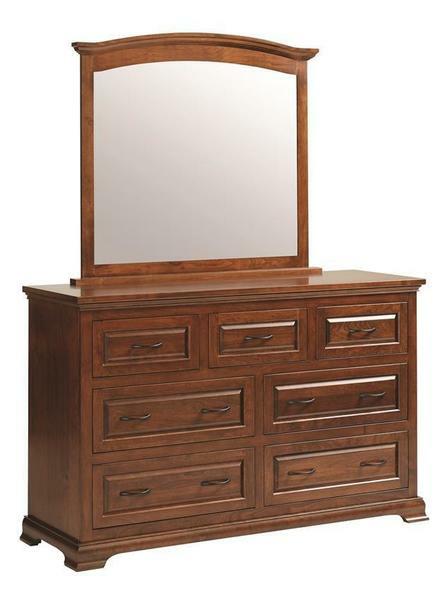 Add spacious storage and warmth to any bedroom suite in your home with our handcrafted Wilkshire Dresser. Bench-built by skilled Amish artisans, the Wilkshire Dresser is crafted with an antique-inspired Early American design that ensures charm and depth in any decor. Seven deep drawers, complete with dove-tailed drawer boxes fixed to the case with high-quality ballbearing glides, provide plenty of space for clothes, linens, and any other bedroom items you'll need to make your daily routine easier. Add the optional matching mirror and you'll have a beautiful backdrop for your dresser that complements the look and provides a simple way to ensure you're looking great as you head out to face the day. Choose from a wide variety of hardwood and finish options to ensure your new Wilkshire Dresser will work with your bedroom decor. Once you've narrowed down your preferred combination, choose from a range of hardware and drawer slide options to put the final touches on this stunning dresser chest. If we missed something, or you have questions about our Wilkshire Dresser, please don't hesitate to give us a call. Our furniture specialists are available to provide free custom quotes, stain samples, and to help you start your order by phone. Each piece is handcrafted just for you, and made for a lifetime of use - let us help you build a bedroom suite that will be loved for generations.